I’ll begin this morning by defining what Alchemy is. Alchemy was the ancient practice of combining matter, physical stuff, together, in such a way that you produce something with supernatural power. It was the art of transformation. You can think of the caterpillar – it goes into its cocoon, and therein undergoes a complete transformation. It does not merely modify, or gain extra components, but its whole form breaks down and is reconstituted into the butterfly. So in Alchemy the substances used are broken down into a state of chaos, from which a miraculous physical substance emerges which can produce magical results. Sometimes these magical results in alchemical books are defined, and sometimes, probably most of the time, it is left far more elusive. When they are defined, that’s where we get the famous examples like the philosopher’s stone, capable of turning any ‘base metal’ into a so called ‘noble metal’, such as gold. Or, the elixir of life, or elixir of immortality, which grants eternal life or eternal youth. In my short story, I painted a picture of an old man who had devoted his life to this task, trying to evoke the tragic nature of this pursuit. Countless decades devoted to an art with an impossible end. The historical figure who comes to mind is the proto-Unitarian, Isaac Newton. Yes, he laid the foundation of modern physics, and invented calculous. Yes, he proved categorically that the planets revolved around the sun. Yes, he discovered the laws of motion and gravity. But to him these were all side projects. 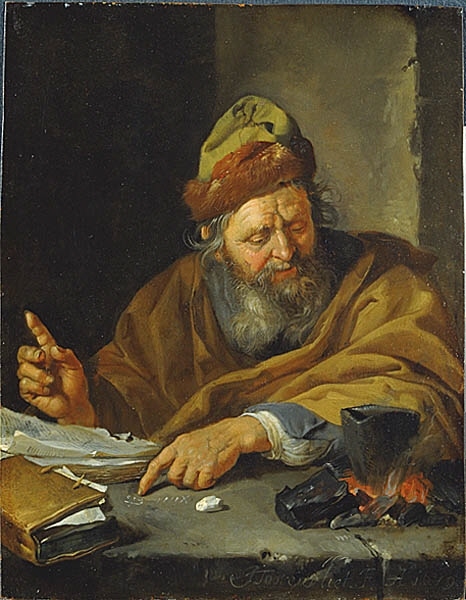 He was first and foremost an alchemist – the most famous alchemist to ever live. It's an odd thing to reconcile, that the greatest scientist ever would devote most of his energy to a pseudoscientific art. We may be baffled today, but those around him then in 17th Century who knew he toiled at this illegal art were equally baffled. I gave you that quote on your order of service from Humphrey Newton (of no relation), his lab assistant, who said, “What his aim might be, I was not able to penetrate into, but his pains, his diligence at these times, made me think he aimed at something beyond the reach of human art and industry.” Newton believed that in an ancient Edenic past, humanity knew great truths about nature and the universe. Whereas today, the normative belief is that the height of human knowledge and potential is before us, in some future time, it was once the normative belief that the height of human knowledge and potential was behind us, in a spiritually heightened golden age, and that though direct knowledge of this ancient wisdom had been lost to us, it was encoded in ancient religious texts and myths. And so, if our ancient ancestors possessed the great truths of alchemy, Newton believed he could decode the Greek myths, for example, to recover such ancient recipes. And as strange as that sounds, this pursuit is what occupied the majority of Newton’s time. 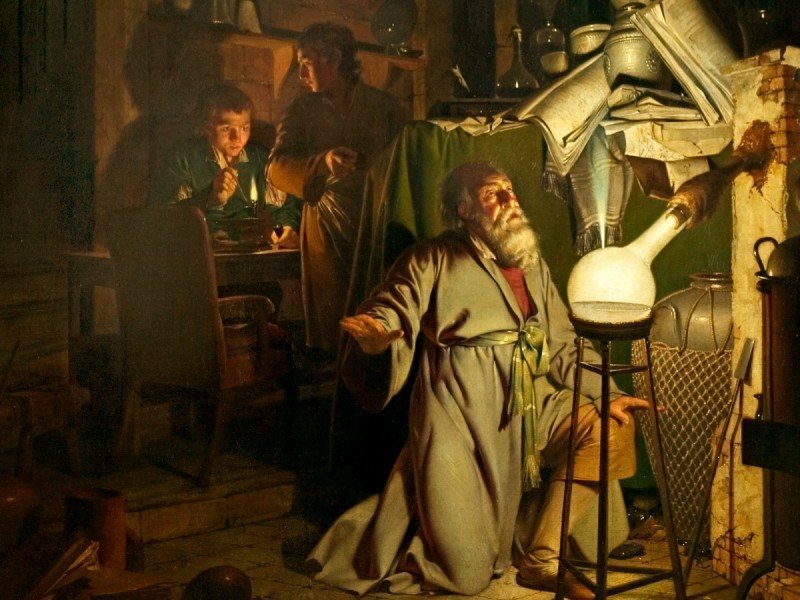 One approach when thinking about Alchemy, then, would be to dismiss it as the primitive superstitions of our ancestors, and I am not unsympathetic to that outlook. The alternative however, would be to understand this art as pointing towards something more foundational, a truth about human spirituality. A truth which bubbles away under a bed of contradictions and errors. We as human beings have a tendency towards infusing matter (things) with subjective significance. So, it’s not just wood, it’s a chair. It’s not just a chair, it’s my grandmother’s chair, and if you spill wine on I will be deeply hurt. It’s not just metal. It’s a ring. It’s my ring. It’s the ring that signifies I am married to this person, and marriage entails: long list of cultural norms… There’s a tendency then for human beings to take the deepest longing of ourselves and in some way project them out onto the world around us. So, when we think about alchemy you can imagine a process in which alchemy was once an art of the interior self, the transformation of the self, which in time became an art of transforming matter. This was an insight of psychoanalyst Carl Jung. So, you have practitioners, who we can call alchemists, but they’re not manipulating matter, or experimenting with matter, or seeking to transform matter, rather they are seeking to transform the self. Or transform their souls. So, such people believed that spiritual transformation was possible. Think back to the caterpillar. Not minor alteration, but radical transformation. And what would be produced, what would emerge, would be a new type of human being. Like the supernatural matter from the alchemist’s bench, one would unlock the supernatural potential within the human soul. And then as Christianity became dominant in the western world in the second, third, fourth centuries, these mystery movements, schools of thought concerned with unlocking the mysterious potential of the self, were persecuted or suppressed. And so, individuals within such movements changed into what we understand today as alchemists. Manipulators of physical matter. Because to the powerful, kings and rulers, for them to have sects of people practicing interior transformation (such as the mystery cults, the gnostic, hermetic orders and the like), such groups are potentially threatening. They could destabilise the status quo, but having an alchemist in the castle trying to make you gold - that is less problematic. Alchemical symbol for the philosopher's stone. So, Carl Jung, who I have spoken about a lot before - the Swiss-born psychoanalyst, who along with Freud developed the ‘talking cure’ and came up with idea of the collective unconscious - he was concerned with dreams, and he developed the archetypes theory, those stories that we all can’t help enacting into the world. He thought of himself in this primal sense as an alchemist, concerned as he was with radical transformation of the self. Alchemy is a very good analogy for that process that we all go through in our lives. Human souls have the capacity to transform, and they do so by following a pattern which is very closely echoed in what happens upon the Alchemist’s bench. So, what does that look like? It begins with a recognition that spiritually, we want to grow. We want our consciences to grow and expand. The other drive within us is the ‘pleasure principle’, which is also true. We seek our own pleasure and gratification. But that alone is not enough. If we only seek our own pleasure we’re ultimately left feeling hollow. That’s why spiritual paths which hinge upon a version of ‘follow your bliss’ are ultimately vacuous. You know, Californian spirituality. Fluffy feel good spirituality. We recognise then that interior transformation is desirable. But more than that, this drive for spiritual transformation is deeply embedded within who we are. Because, and there’s a problem here, what most people often mean when they talk about wanting more spiritual growth is that they want to have more of what they already have. Or they want what they already are to be reflected back at them, in order that they can feel good about themselves. Spiritual growth for the fool is growth into a bigger fool. Whereas real spiritual transformation happens over the alchemist’s flame; it is uncomfortable, traumatic perhaps, painful perhaps, it happens when we are ill at ease. Remember, I said that upon the Alchemist’s bench the raw matter, the components of our soul, are broken down into a chaotic state, a chaotic state of the soul. A Dark Night of the Soul. There’s an old Alchemist dictum which Jung was very fond of. It’s in Latin so I’m definitely going to butcher this pronunciation, but it went “In sterquiliniis invenitur”, which literally translates as, ‘In crap it will be found.’ And this is a hard truth to accept, that that which we most need to grow spiritually is found where we least want to look. Or, you learn, or grow spiritually, through voluntary contact with that which frightens or disgusts us. So obviously that cannot be a normative state of affairs. We can’t be having a ‘Dark Night of the Soul’ every day, but periodically allowing our consciousness to submerge into chaos is a necessary component of spiritual development. We have to choose to put ourselves over the Alchemist’s flame. And this is known to us, that in trying times, we are either consumed by the fire, which is obviously a real possibility, or we emerge more refined, and more whole than we were before. You endure the conflict, the paradox, the battle, and you emerge more complete, in whom the opposites are reconciled. You confront in yourself the horror, the abuse, the trauma, the moment upon which everything turned, the sadness, the loss, and you grow. The conflicting components within us, the substances within the flask upon the alchemist’s bench, are harmonised into a single unity, and we are made whole. And so, those episodes in our own life which were most painful, can, if reconciled within us, be the very episodes that build us into the more complete individuals we are becoming. In closing then, I’m going to explain why I chose the wrath-filled reading from Ezekiel that we started with, that Robert read out for us. The most obvious reason is that it talks about metals being purified, the smelting fires of the Lord refining and moulding us, which is not unlike the Alchemist’s flame which I’ve been speaking about. My primary motivation though was the wrath of God itself. In the Old Testament, the divine is obviously personified in the God of Israel, and we know what the characteristics of this God are; he is described in the Bible as Love, Peace, Perfection, Hope, Gentleness, Truth, etc etc. But also, as Anger, Wrath, Justice, Judging, Divine Fury. And it is our liberal religious impulse of course to minimise the judgy God, and maximise the loving God. The peaceable God. The gentle God. And this whole address about the alchemy of the soul shows us why it may not be that simple. It’s a problematic conflict. A problematic paradox. We wouldn’t want to say that the negative episodes of our life are of God’s making. If our prospects take a sudden turn for the worse, or a loved one dies, or whatever negative thing befalls us, we wouldn’t want to think of that as being of God. But if, in turn, it is these calamities which cause an edification of the soul, then perhaps it is, with the benefit of hindsight, reasonable to see that as God’s doing. It seems both appropriate and inappropriate to say as much. You can’t tell someone that they should view a calamity as spiritually beneficial. In the rawness of the experience such a sentiment is merely callous, though perhaps in time they themselves will see it as such. It does make some sense of God’s wrath in the Bible if you interpret said negative event as the work of God, indeed the wrath of God. And if that wrath purifies our souls, and moves us towards spiritual maturity, then it is of benefit, no? And how can we not say that that which edifies us spiritually is not of God? In the crap it will be found. And so, within the flame of the Alchemist, we bubble into an impure broth. We have our dark nights of the soul, but in time we transform into a precious substance. A precious soul comes, is brought forth. We are subject to the wrath of God, the calamities of this world, and in turn, we are moulded into something still greater. And so, the drive within us towards spiritual depth is satisfied a little more. We move a step closer within our interior world to that pearl of great price, that philosophers stone, that elixir of immortality.